(l to r) Vincent D’Onofrio, Martin Sensmeier, Manuel Garcia-Rulfo, Ethan Hawke, Denzel Washington, Chris Pratt and Byung-hun Lee star in Metro-Goldwyn-Mayer Pictures and Columbia Pictures’ THE MAGNIFICENT SEVEN. ©MGM / Columbia Pictures. CR: Scott Garfield. Remaking a Hollywood classic like “The Magnificent Seven”—even if the 1960 Steve McQueen film is an adaptation of the 1954 Japanese epic “Seven Samurai” itself—is no easy task. While some find that MGM and Columbia Pictures’ star-studded attempt isn’t quite as magnificent as its predecessor, director Antoine Fuqua (“Training Day”) doesn’t exactly bring knives to a gunfight, either. A slightly more modern retelling of the beloved Western tale, this “Magnificent Seven” focuses on the townspeople of Rose Creek, who are being controlled by a ruthless industrialist named Bartholomew Bogue (Peter Sarsgaard, “Jarhead”) who wants to mine their land for gold. Bogue has given the poor townspeople an ultimatum: either sell their land to him—cheap—or pay the deadly consequences. When one local man (Matt Bomer, “White Collar”) stands up to Bogue after he sets fire to Rose Creek’s church and loses his life because of it, his wife Emma (Haley Bennett, “The Equalizer”) sets out to find help before Bogue returns to town in three weeks to make good on his promise. While riding through a nearby town, Emma comes across a bounty hunter named Sam Chisolm (Denzel Washington) and tells him about the people of Rose Creek’s plight. Chisolm agrees to help her out and recruits a motley group of outcasts and outlaws to help prepare the townspeople for battle: smart-mouthed gambler Josh Farraday (Chris Pratt); sharpshooter Goodnight Robicheaux (Ethan Hawke); Goodnight’s knife-wielding, right-hand man, Billy Rocks (Byung-hun Lee, “G.I. Joe: The Rise of Cobra”); Mexican outlaw Vasquez (Manuel Garcia-Rulfo, “Cake”); tracker Jack Horne (Vincent D’Onofrio); and Comanche outcast, Red Harvest (Martin Sensmeier, “Salem”). As the mercenaries get ready for the final showdown, it becomes clear that they’re fighting for more than just money. Each one has his own reason for going into battle, whether it’s for justice, redemption—or revenge. As always, Washington does a commendable job as the leader of the so-called Magnificent Seven, even if his perfect pearly whites are a bit distracting in the Old West. Pratt shines as well, adding some humor to the film to keep things from becoming too serious. The rest of the gang does what they can with the limited amount of screen time each character is given. 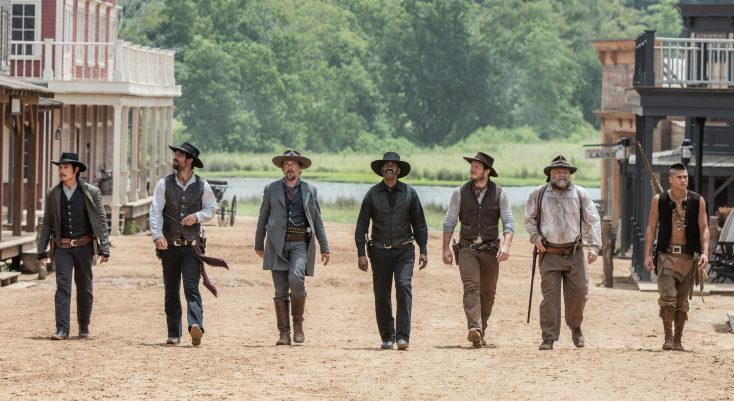 If there is one missed opportunity with “The Magnificent Seven,” it would be how underdeveloped some of the characters are—not to mention, for the most part, how easily they all work together. While moviegoers may be used to the outlandish idea that a small band of brothers can sometimes take on an army by themselves and win, seeing an Indian tracker team up with a Comanche no questions asked seems a bit unbelievable, even by Hollywood’s standards. A few questionable plot points aside, screenwriters Richard Wenk (“The Expendables 2”) and Nic Pizzolatto (“True Detective”) craft a fun, action-packed story that moves along at a brisk enough pace so that audiences won’t grow bored throughout its two-hour-and-12-minute runtime. The movie has plenty of humor and action peppered throughout to keep viewers—even those who aren’t typically fans of the Western genre—entertained, and it’s nice to see a strong female character added into the mix who isn’t afraid to fight for what’s right. There is some gorgeous scenery, too, although it’s a bit disappointing that the IMAX presentation doesn’t capitalize on that (or the action sequences) as much as it could. For those thinking of seeing “The Magnificent Seven” on an IMAX screen during its limited seven-day run, save a few bucks and opt for the standard presentation instead. You won’t miss much. 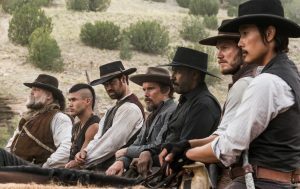 While it’s only natural for fans of the original “Magnificent Seven” to draw comparisons between the two films, those who treat this latest “Seven Samurai” retelling as its own action-packed adventure might just walk away pleasantly surprised. Although there are times the film is a bit cheesy, for the most part the movie is well-acted, entertaining and should be judged on its own merits. It may not be magnificent, but “The Magnificent Seven” is still quite satisfying.